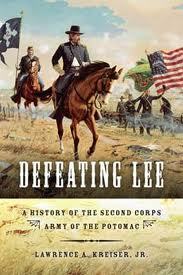 Defeating Lee: A History of the Second Corps, Army of the Potomac, Lawrence A. Kreiser, Jr., Indiana University Press, 2011,388 pp., appendices, bibliography, notes, index, maps, illustrations, $34.95. In the American Civil War, an integral role was played by the Army of the Potomac. One of the cornerstones of this army was the Second Army Corps. Lawrence Kreiser tells the Second Corps' story with verve and attention to personal as well as bureaucratic details. The author's study grapples with whether the Second Corps "is a sample providing insight into the rest of the Union army or a subject with its won distinct history." To the author's credit both offers both insight into the commonality of Union soldiers and the uncommon story of a corps that fought from the Peninsula to Appomattox. Kreiser breaks the four parts. : 1. the organization and first experience of combat [the Peninsula and Maryland campaigns], 2. the consolidation of the corps leadership and its immersion into combat [Fredericksburg through Mine Run campaigns], 3. the shredding and rebuilding [Overland, Petersburg, and Appomattox campaigns, 4. the remembering and memorializing of the corps [the Grand Review through the Grand Army of the Republic associations and the publication in 1887 of the Second Corps' history by former staff officer Francis Walker who died in 1897]. 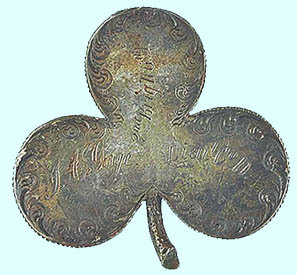 Four of ten Second Corps soldiers became casualties during the war, the highest numerical losses of any Federal corps. Kreiser explains how paid the men paid such a high price for their service. Soldiers' motivation changed over time; leadership was developed then lost in battle and then developed again. The author at times takes an analytical approach to understanding the corps' story from its creation to the efforts of its veterans. At other times, he presents the lives of the soldiers in the words of the soldiers and their families. Kreiser adequately handles the movement within the high command of the army from brigade and division organization in 1861 to division and corps organization in 1862. By early 1863, the corps had earned the reputation of solid endurance, faithful obedience, and for hard marching and fighting. By the Gettysburg Campaign, it along with the First Corps was the backbone of the Army of the Potomac. After the destruction of the First Corps on July 1, the Second and Fifth Corps became the spine of the army. In Defeating Lee Kreiser places the battles along side national and army politics. The replacement of enlisted men and commissioned officers is a constant dilemma for the corps throughout the war. The impact of both battlefield casualties and the attempt to raise new regiments with little regard for veteran units is both a moral and administrative issue. The enlistments of 1864 create a constant change in brigade and division level cohesion and effectiveness. Though Winfield Scott Hancock is on the cover, Defeating Lee is not just his story. There are a great deal of admirable leaders at the regimental, brigade and division level that allows Hancock to succeed at corps command. Notably, the book does not end at Appomattox or the Grand Review. Kreiser continues the story of how the commanders angled for opportunities to tell the war from their point of view.All in all, Kreiser pays close attention to Francis Walker's 1887 history and both expands and corrects it. Hopefully, other corps histories will be told with the attention to detail, argument, and context that Kreisler has given to the Second Corps, Army of the Potomac. In a query to the author, CWL learned that Unfurl Those Colors: McClellan, Sumner, and the Second Army Corps in the Antietam Campaign by Marion V. Armstrong does not appear in the bibliography because Defeating Lee had been accepted by the publisher, edited and scheduled to be printed when Unfurl Those Colors was release in spring 2008.